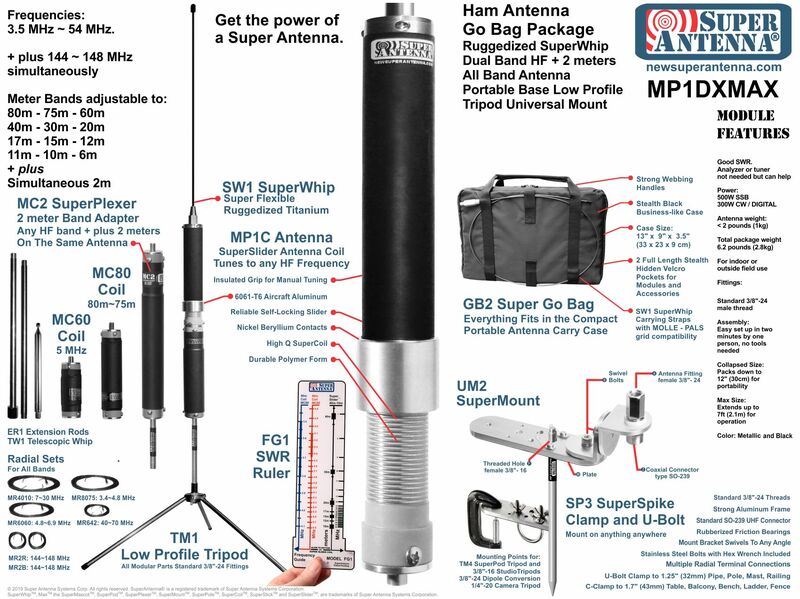 The Super Antenna MP1 is a Ham Radio HF Portable Antenna that also covers VHF-UHF. For Indoor or Outside field use. Big signal in a small package. MP1B forms the basic core antenna of the various MP1x series Super Antennas. It is a manually tunable antenna. It can form a portable vertical or a mobile whip. Two MP1B units can form a portable rotatable dipole, with a suitable dipole mount. Size: Packs down to 12" (30cm) for portability and extends up to 7ft (2.1m) for operation. Can be used in vertical or horizontal position. DX and NVIS. Easy set up by 1 person in two minutes without tools. Good SWR: below 1.5:1 or better, no analyzer or tuner needed. High Q SuperCoil. SuperSlider manually adjusted for Maximum Efficiency. Telescopic whip with standard 3/8"-24 fittings. Power Rating: 500 Watts SSB (300W CW/Data). Color: Metallic. Weight: 1 pound (0.5kg). This antenna has a 3/8"-24 male fitting at the bottom. Requires a standard 3/8"-24 mount for operation, sold separately. Recommended Super Antenna Mount models: UM1, UM2, UM3, TM1, TM2, or DM2. Also works with most standard ham and CB mounts having standard 3/8"-24 female threads. 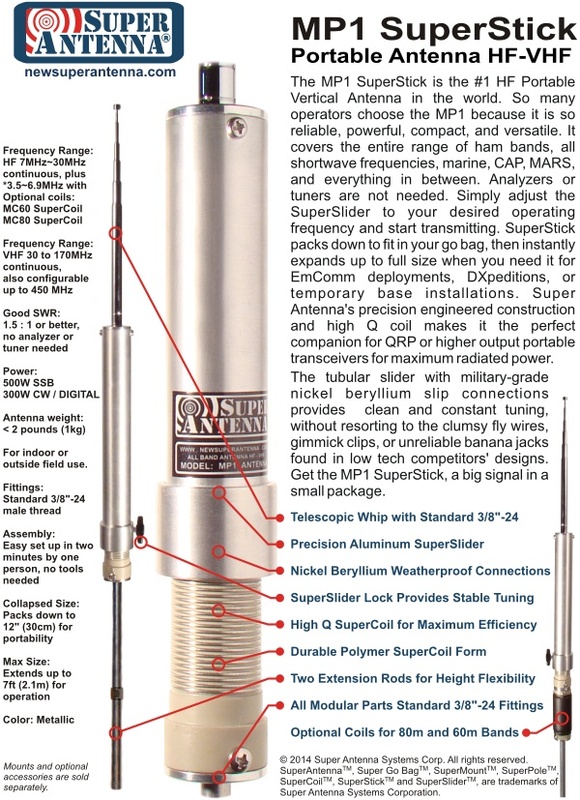 The MP1B SuperStick antenna element length is 7 feet 0 inches (2.13m) at its longest when extended and tuned to about 7MHz. It is slightly shorter on other frequencies. The total MP1B SuperStick antenna element length is 7 feet 5 inches (2.25m) when used with the optional MC80 SuperCoil for 80 meters and tuned to about 3.5 MHz. The TM1 SuperMount Low Profile Tripod height is 7 inches from floor to top of mount. The total height of MP1B Antenna on the TM1 Low Profile Tripod is 7 feet 7 inches. This combination is designed to fit indoors in a standard 8 feet floor-to-ceiling American home.